Mint Juleps and Big Hats…. Yes, it’s that time of year again. The Kentucky Derby is May 3rd, and there will be a record number of Mint Juleps being made and served around the country. The Mint Julep is as synonymous to the annual race held at Churchill Downs as Margaritas are with Cinco De Mayo If you’ve never had one, it’s one of those drinks you have to experience at least once, and preferably when it’s “trendy” like right now so you can get your feet wet with a crowd of others. 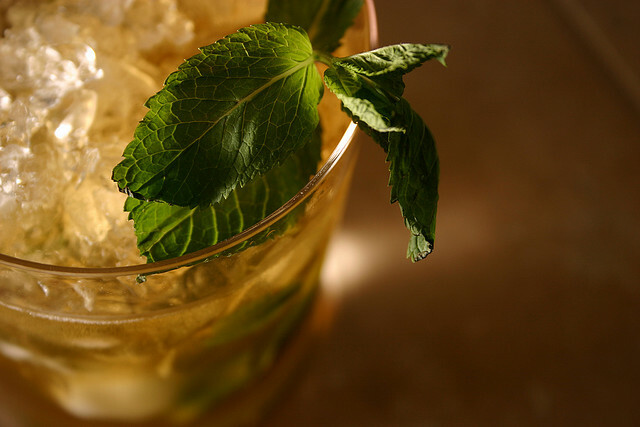 Gently crush mint leaves in a cool tall glass. (Lightly muddle the mint and sugar with a splash of soda water in a mixing glass.) Fill the glass with cracked ice. Add Four Roses, club soda and stir well. Garnish with a slice of orange and a few sprigs of mint, and serve. Sample Provided by Four Roses Bourbon.